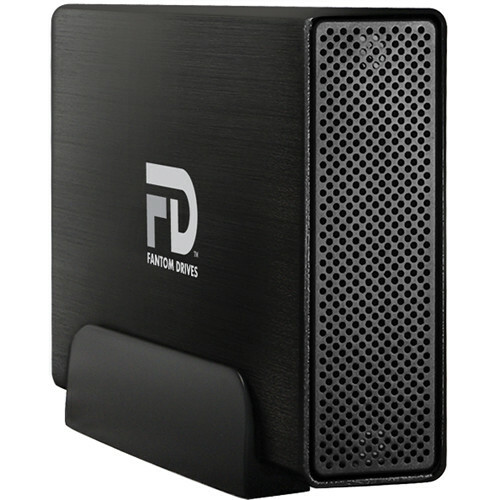 Store, carry, and protect all of your data with the 2TB G-Force Quad USB 3.0/2.0, eSATA, FireWire 800/400 External Hard Drive from Fantom Drives. With a capacity of 2TB, it can be used for additional storage or for backing up your videos, photos, music, documents, and more. The G-Force Quad is compatible with Windows and Mac systems and connects to your system via a USB 3.0/2.0, eSATA, FireWire 800, or FireWire 400 interface. The USB 3.0 port is able to achieve data transfer rates of up to 5 Gb/s, while also being backwards compatible with USB 2.0 at rates up to 480 Mb/s. The eSATA port uses a SATA II revision at speeds up to 3 Gb/s, the FireWire 800 port transfers data at speeds up to 800 Mb/s, and the FireWire 400 port operates at up to 400 Mb/s. The Fantom G-Force Quad operates using a quiet, fan-free design with an aluminum heatsink. It may be used as a bootable system drive, so long as the host hardware and operating system support booting from eSATA or USB. Using its FireWire ports, it is possible to daisy-chain this drive to other compatible drives. The Fantom G-Force Quad is compatible with both Windows and Mac operating systems. It comes pre-formatted HFS+ for Mac with an Apple Partition Map and will need to be reformatted as NTFS for use with Windows. Included with this drive is a 3.3' eSATA cable, two 3.3' FireWire 800 cables, one 3.3' FireWire 400 cable, one 3.3' USB 3.0 cable, a 110/220V universal power supply, and a power cord. The Fantom G-Force Quad is protected by a limited 1-year warranty. Box Dimensions (LxWxH) 10.7 x 9.0 x 2.4"
2TB G-Force Quad USB 3.0/2.0, eSATA, FireWire 800/400 External Hard Drive is rated 4.6 out of 5 by 9. Rated 5 out of 5 by Danimal from Good so far I have had problems with other external hard drives in the past causing me to loose entire projects. This purchase is an attempt to find a brand replacement for those others. So Far So Good. There are plenty of connectivity options on this hard drive so compatibility is not an issues. The speed seems to be a bit slower but it is nothing that really affects my workflow, and dependability is really what I am after. I need to be sure my projects are safe. I've been using it on my current project pretty heavily for a couple of weeks now and so far there have been no problems. Rated 5 out of 5 by Andrackegregory from eSATA for Verizon FiOS DVR I use this to extend the capacity of my FiOS DVR. It's an eSATA (plus other configurations) drive and at 2TB it provides many more hours of recording, about 260 Hours of HD recording and then the system switches to the DVR and its more limited recording capability. It's been in operation for about 2 weeks and I have no complaints. One niggle, the drive never sleeps, runs all the time and I wonder if that is proper. One would think it could sleep and the FiOS system would wake it on demand. Placed in a cabinet, one can barely hear it, but some users may think it's noisy. Rated 1 out of 5 by Optimistic buyer from Don't waste your time First of all, my computer did not recognize the drive - at all! Then I had to jump hoops just to manage the drive. Another user said the same thing, and it took 8 hours just to format the drive. I would definitely not recommend this product to my friends. Bought a Seagate instead. Much easier and faster to work with! Rated 5 out of 5 by DW from Excellent Hard Drive This hard drive was very easy to set up and was immediately recognized by Mac Time Machine. It is incredibly quiet and when backing up my data it does not noticeably slow down the computer. I recommend this hard drive and would certainly purchase it again. Rated 5 out of 5 by Dave from Works great on the old iMac Works great with my old iMac. (mid 2007) No problems at all. I reformatted it and partitioned it to work on Windows and the Mac. Works perfectly with Time Machine for a back up drive. Rated 5 out of 5 by Kent H. from Very good drive I wanted an old school drive with lots of connections that I could daisy chain. This drive fits the bill and so far so good. Rated 5 out of 5 by Libregirl from Great product and price for my project Using drive to transfer files from Sony DCR-TRV50 Digital Video Camera Recorder to my MacBook Pro. Is this drive bootable if connected through a fire FireWire port? Normally it certainly would be - but this completely depends on your MAC OS and other variable parameters. Best to confirm with Fantom support before buying.